This mod is BETA version. Works with DAF, Iveco, MAN, Mercedes-Benz, Scania, Volvo trucks. How do you lift the axle or is it lifted automaticly? does it works to with Renault trucks ?? dude how do ulift an axle of a 4×2 truck? thank you man your the best ! You have to buy the default 6×4 chassis and click “drive” to see the change. or else; return to Windows and start the game again. The last one is a standard fix for every wheel position mod. i want the axel down but how i do that.?? Aim liking the idea of this, it looks cool and getting it in-game works fine for me but it makes the truck oversteer, especially with a trailer attached. Would also be good if the axle was lowered once you attached the trailer. Seeing as its Beta hopefully a improved version will come. But as I said aim very much liking the idea of mods like this, brings something fresh into the game! 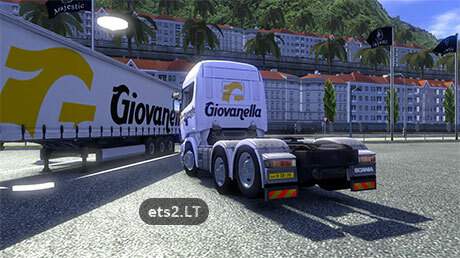 For those who want to know about this mod,once you have it present in your mods and set to be on (version 1.3/1) rear axle lift will be UP permanently until you stop, save game, go into profile (version 1.3/1) and turn off or earlier versions you would have to save and exit game, remove mod and start game again then continue from save. Makes more sense to run the version 1.3/1 so you don’t have to exit the game. Both this axle mod and the midlift change the trucks handling abilities quite a bit and yes your are more likely to have an accident due to the physics change. Until SCS or a genius modder comes along and creates a scripting code that allows the axle to be dropped at a press of a key, we have to wait. It won’t be long before someone figures it out, we have trailers that raise and drop the legs, open shut doors and even those that give us a Forklift when we drop the trailer, those are done by clever use of code and scripting, only a little time for someone to develop the axle raise/drop. Part of the problem is making the animation of this. Update your game and make life easy for yourself. ..this is the best answer ever … thank you.. Thanks for explaining the mod in a bit more detail. It’s nice aesthetically, but I’d only use it for screenshot value. As for the trailer legs/doors opening/forklift, unfortunately it hasn’t anything to do with coding; I once thought it was until I learnt Zmod2, and discovered that there are separate pieces to a mod (for example, on a truck the cab and chassis would be separate pieces that make up the puzzle), and with the trailer there are models for ‘legs_up’ and ‘legs_down’. To add the doors and forklift, simply add the doors and FLT to the ‘legs_down’ piece of the model so that when the trailer drops and the model swaps from up to down, the doors appear to open and a forklift appears. With the trucks themselves, I can’t think of any piece of the truck that has such a model type, (up/down, on/off anything), other than animations like the windscreen wipers, which if they were used would only allow you to raise and lower the axle in a single motion, rather than set it to be raised/lowered. If some clever clogs managed to work out how to code in a new key bind, which causes a new animation to work (like the interior indicators, hit the button once and the switch moves, hit the button again and it returns), then we’re in business ! Sorry to sound like a know-it-all. I’m really not, I’m just learning – slowly ! Who is author of this mod?? ?